I had half a mind to exclude Avengers Assemble altogether from my Marvel NOW! reading order. Partially this was because of how uninterested I found myself in the Brian Michael Bendis helmed first seven issues (when Zodiac and Thanos fall flat, you know you’re in trouble), but mostly because Avengers Assemble is the most heavily connected to the Marvel cinematic universe of any Marvel comics. In many ways, this is a comic that feels disconnected from Marvel continuity at large (it’s kind of a hobby). Nonetheless, with Kelly Sue Deconnick taking writing duties, and with a long run of tie-ins to Age of Ultron and Captain Marvel: The Enemy Within, Avengers Assemble has earned its place in the Marvel NOW! reading order (literally the highest honor I can bestow). And Now Out of Theaters… The Avengers! The versions of Iron Man, Black Widow, and Hulk you see within these pages are clearly derived from Joss Whedon’s Avengers. Don’t get me wrong; I love The Avengers. But there’s a fairly distinct separation between movie Iron Man and comic book Iron Man (although that line is blurring all the time). Namely, movie Iron Man is a lot more fun. Kelly Sue Deconnick embraces the Robert Downey Jr-ification of the character, crafting a cocky, charismatic Tony Stark whose eternal optimism is at odds with Bruce Banner’s “dour dour-ness.” The Banner and Stark relationship is also clearly lifted from Avengers, with a general science-buddies feel that somehow doesn’t cave when Deconnick has Tony joke about shooting the Hulk into space. It’s cool, it’s not like he tried to kill the Illuminati and conquer Earth when he returned. Deconnick enhances the cinematic Avengers experience by adding real live women (gasp!) like Spider-Woman and the all-new (and newly clothed) Captain Marvel. The first two issues of the Marvel NOW! iteration (issues #9 and #10) occur before Jonathan Hickman’s Avengers #1, and frankly the two series are so diametrically dissimilar that attempting to reconcile continuity would be like putting pepper in your salt shaker – pure lunacy. Before the tie-ins begin with Age of Ultron in issue #14, Avengers Assemble #9 – #13 is for Avengers fans who love the movies, and want some fun in their comics. Hickman embraces more of the high-minded Bruce Banner dourness than DeConnick, who showcases her tremondous gift for dialogue within these pages. 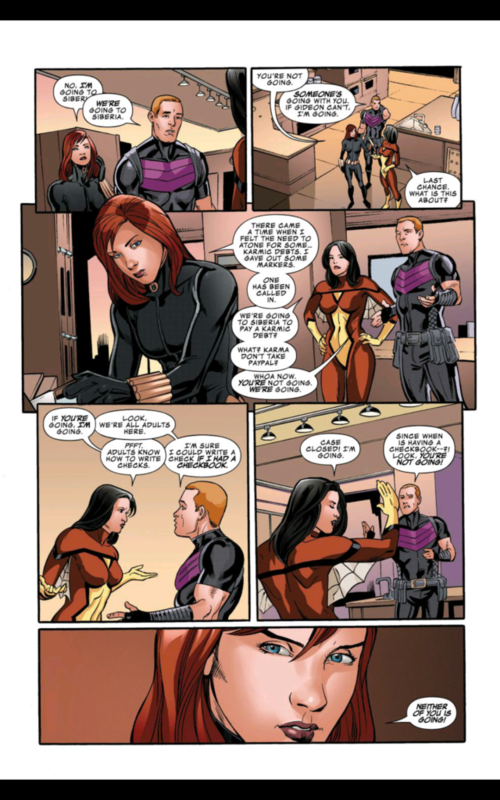 You’ll feel like you could listen to Spider-Woman, Hawkeye, and Black Widow do nothing but talk in a room all day long. I can’t oversell this, but these are fun, Avengers adventures and HIGHLY recommended for younger readers or fans coming to comics from the movies. You’re right 🙂 I thought that looked weird too. But honestly it’s a totally fine book, but it’s just kind of hollow fun.